The K League Classic continues this weekend with it’s 30th round of games. This weekend is also sees the return of afternoon games as the weather starts to cool down. The highlight game of this round of games is the heavyweight clash between league leaders Jeonbuk Hyundai and 4th placed 2013 champions FC Seoul. Both sides have found form hard to come by and this come be a very interesting game. The league table is lead by Jeonbuk Hyundai who have top since close to the start of the season and are 8 points clear. Suwon and Seongnam FC are just behind them, with Seoul, Pohang and Incheon completing the top half. 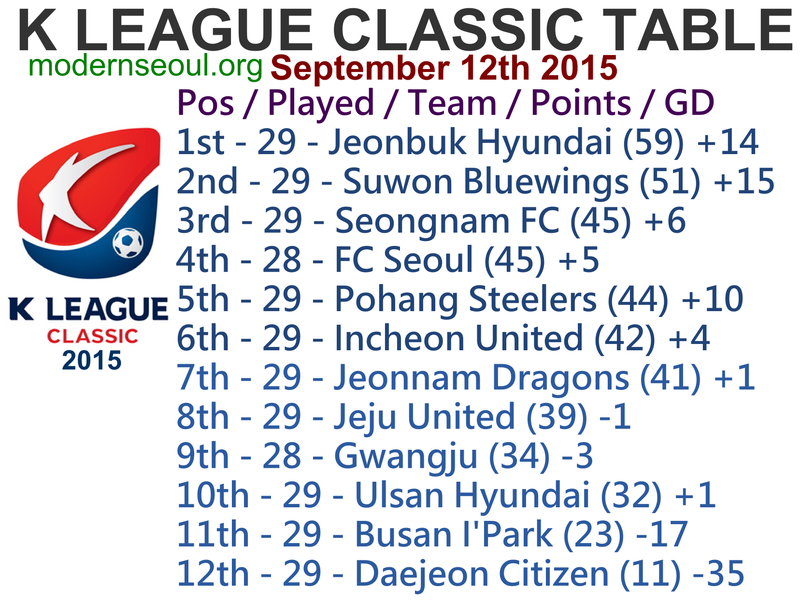 Jeonnam Dragons lead the bottom half in 7th, with Jeju United and Gwangju in 8th and 9th. Then come Ulsan who are 11 points ahead of 11th placed Busan and finally Daejeon who are 12 points adrift, completing the table. Pohang Steelers currently sit in 5th place and have drawn their last 4 games of the bounce. 3rd placed Seongnam have have a couple of poor results in recent weeks and will be looking to improve and bounce back. This on paper looks like draw, but it really could go either way. League leaders Jeonbuk have lost 3 and won 2 of their last 5 games and have been very inconsistent over the past month. They also have their Champions League Quarter Final match to think about (its on Wednesday). FC Seoul have lost a little form drawing and losing their last 2. Again on paper this one looks very close and a likely draw. 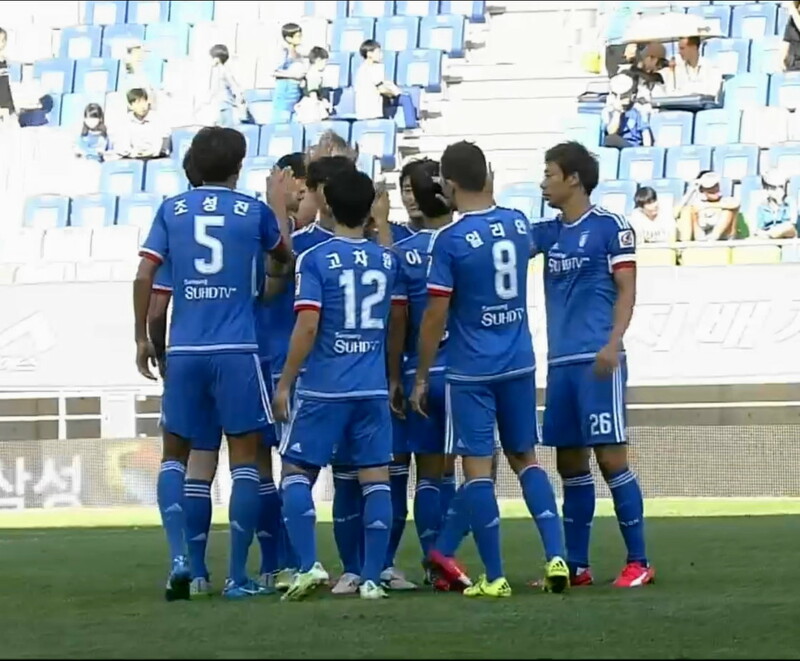 Suwon Bluewings are currently 2nd and have 3 wins, 2 draws and 1 defeat from their last 6. Incheon United lost their winning run on Wednesday falling to a surprise defeat to Gwangju. Suwon will come into this one slight favorites as they are at home, but it will be close. Gwangju broke a 3 game losing run beating Incheon United during the week, in maybe the biggest shock of the month so far. Busan I’Park have only 1 win in over 3 months and look almost settled to finish 11th. Gwangju will be favorites here. 7th placed Jeonnam Dragons have drawn 3 straight and are now only a single point away from the top half. Bottom side Daejeon Citizen have the worst defense and weakest strikeforce in the league. They’re also 12 points adrift at the bottom. Jeonnam will be favorites here. Jeju United have recently found a little form and are now on a 3 match winning run. Ulsan Hyundai are also on a winning run of 2 games and have started to bridge the gap to 9th place. Jeju United will be favorites here, but it will be close. 1 correct result after a weekend of surprises and draws. Round 29: Only 2 correct results and no perfect scores. Round 28: 2 Correct but no perfect scores. 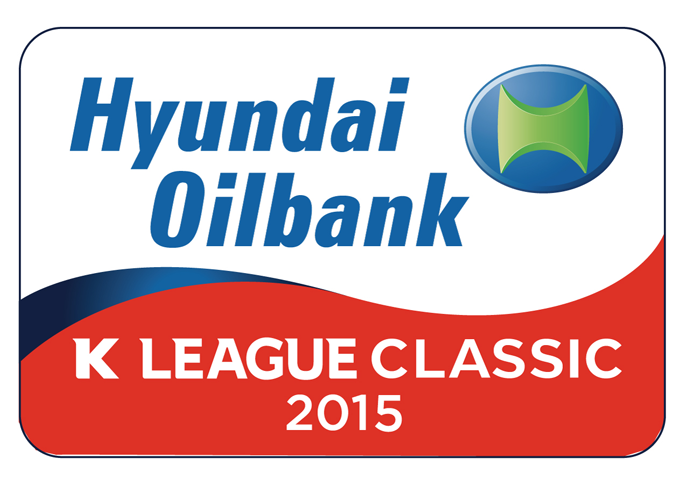 The K League Challenge moves into the 33rd round of the 2015 season. The highlight game of the this round of fixtures is on Saturday and between 4th placed Bucheon 1995 and league leaders Sangju Sangmu. Bucheon have been solid at home all season, whilst Sangju have lacked consistency in recent weeks. Therefore is could be a very interesting game and maybe a surprise result. 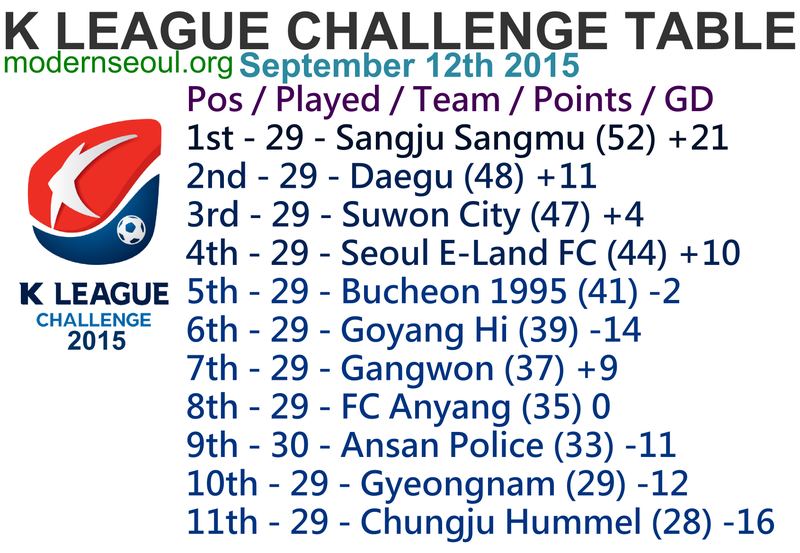 The league table has now started to take shape, Sangju Sangmu now have just a 4 point lead at the top of the table. They are ahead of Daegu, Suwon and Seoul E-Land who make up the playoff places. Bucheon and Goyang are just behind them. Gangwon, FC Anyang and Ansan are still slightly in the playoff race in 7th-9th. 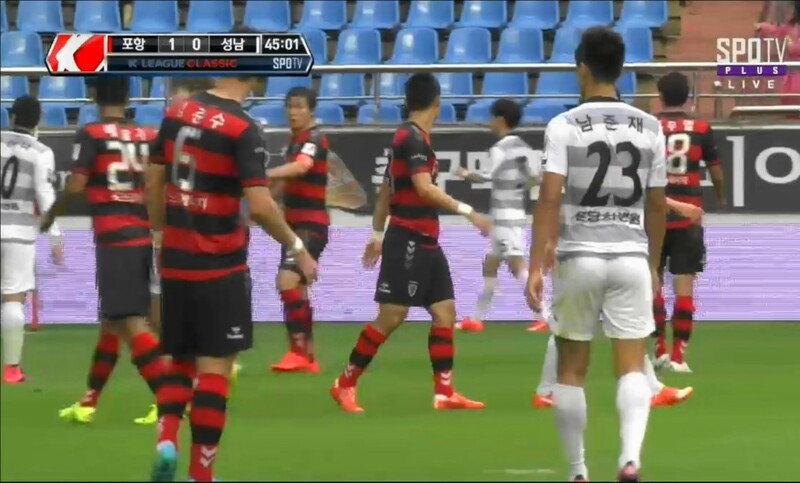 Gyeongnam are 10th and finally bottom club is now Chungju Hummel who slipped down to the foot of the table.